High Build Systems | Floor Coatings, Etc. High Build Systems are always applied over a “shot blasted” surface. They consist of a minimum of two applications of a squeegee applied and back rolled 100% solids epoxy applied at 10 to 20 mils each. 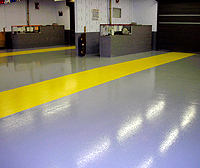 Usually the epoxy is finished off with one or two applications of a roller applied aliphatic urethane when gloss and color retention are important. These systems can be used in warehouses, distribution facilities, dealership parts rooms, aircraft hangars and other medium duty areas. Contact us today at 302-322-4177 to learn more about our High Build Systems.